Hi Ron are you asking about a solid 14k case ?, if it is south bend are we talking about a panama case ? I have several 14k South Bend 431s, but they are 12-size. The Polaris movement was cased in the 14K 16s. I have the movement but not the case. For that reason that there are folks holding Polaris movements like Billy, waiting for a 14K South Bend case, of which there were 3 case manufacturers that made these for South Bend and marked them "South Bend", they are scarce and they bring a real premium !! They are scarcer than a "Four Leaf Clover" or a winning Lottery ticket !! if it is south bend are we talking about a panama case ? "PANAMA" was their 20 Year Gold Filled case. "PILGRIM" was their 25 Year Gold Filled cases. "PYRAMID" was their PERMANENT Gold Filled cases. MY 14kt SOUTH BEND HAS A 21 JEWEL GRADE 295. THE CASE IS LIKE ETHAN LIPSIGS BUT 16 SIZE. Nice !! The 295 is the movement that was used for the POLARIS watch, same movement but says "Polaris" on it ! Show us pictures if you will. 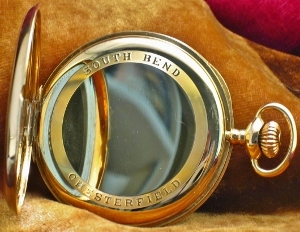 Their three models of 16-size 14K Solid Gold Cases are marked as "SOUTH-BEND WATCH CO. - SOUTH BEND, IND." in a circular fashion around the cuvette or secondary dust cover. (There is question as to whether there were 2 or 3 models as we have only identified 2 of them, although 3 were planned it may be that only 2 styles were actually produced.) Those cases were made on special order by the Brooklyn Watch Case Company who also made similar cases for other watch companies. At this posting you will see a complete "South-Bend Polaris" complete with all original box and paperwork. There are 2 styles of "Polaris" dials, with and without the ribbon or "swoosh" under "Polaris" on the dial, everything about them was special and their special features were not shared with any other grade. In that posting I explained the origins the Polaris being based on the Grade 295 as they selected only the very best running 295s and then enhanced them to become Polaris movements. Only the very best 295s became Polaris and were fully guaranteed for the lifetime of the original owner. 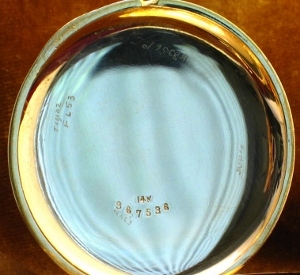 All approximately 500 were originally sold in the 14K 3-hinge specially marked we are speaking of in this topic. About Ron's 295 being in a Polaris case... Likely at some point the movements were changed into different cases, a lot has happened in the past nearly 110 years and many of the watches we find today have been messed with by people who had best of intentions but also had no clue about the ramifications of what they were doing. Please share your Grade 295 and Polaris movement numbers in this topic as we are keeping track of recognized examples. As Buster alluded to, both are superlative movements. Like many of our most desirable watches there are far more Polaris movements than cases making the case, depending on condition, a VERY HIGH DOLLAR commodity. My suggestion would be to use the case to allow a Polaris movement to be joined with it and therefore returned to being a complete watch. I would have a big interest in Ron's watch to achieve those ends, and I am sure he has Billy's attention as well. Any South-Bend Polaris movement can only be fully valued when the movement is once again housed in the correct 14K South-Bend Watch Co. marked case. Hopefully we can make that happen.